Kagan's FREE Articles - Kagan Structures Enhance Brain Engagement! Kagan Structures Enhance Brain Engagement! The focus in this article is not on the engagement we see in our students, but rather the engagement we cannot directly observe — what is going on in the brains of our students when we use Kagan Structures. Contrast a picture and a quote. There is obviously a level of engagement — intense, focused attention and concentration — that is never achieved for most students while they work alone. "School was so boring today that I actually finished the day dumber than when I woke up." The research on brain plasticity informs us that "neurons that fire together wire together" and that we "use it or lose it." It is more than a mere analogy to say the brain is like a muscle that develops with regular exercise. The brain is constantly rewiring itself depending on which parts of the brain are frequently used and which parts fall into disuse. We can actually reshape our brains by choosing to think in certain ways!2 After learning, new dendrite branches and connections are formed. When those connections are reinforced often enough, they grow a myelin sheath allowing faster neuronal transmission. Thus, that bored high school senior may actually be telling us something about the state of her brain! Experiments reveal that if we keep animals in a low-stimulation environment, their brains actually weigh less than those interacting in an enriched environment. Interestingly, increasing the number of toys and other stimulating objects does not do as much to develop brain density as does increasing the number of other animals with which to interact.3 What holds for animals in cages may hold for students in low-stimulation classrooms. The brains of students who work alone may not develop as fully as the brains of students who regularly interact via Kagan Structures. Regular interaction via Kagan Structures may actually increase dendrite branching and increase brain weight. Certainly there is clear evidence that the royal road to brain engagement is social interaction. 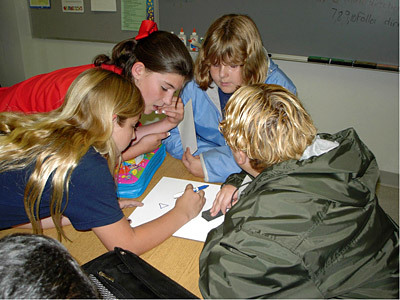 Social interaction creates a stimulus-rich learning environment. PET scans reveal which parts of the brain are more active than the resting base rate. What is obvious is that social interaction produces brain engagement at levels not achieved by simply reading, listening, or talking. What is striking is that the brains of students during interaction in an important way resemble the faces and body language of students using the Kagan Structures — they are more engaged. Why is this so? Why is social interaction the royal road to brain engagement? Let's consider all that is going on while one student shows and describes to a partner how to solve a problem, or explains her thinking. Visual Cortex Engagement. As a student shows another what to do, they are both looking at the worksheet or manipulative so the visual cortices of both students are engaged. Further, during communication the students produce non-verbal messages (body language, facial expressions, gestures) that are processed in the visual cortex. Wernicke's Area Engagement. As they explain their thinking, students have to decode each other's words. This engages Wernicke's Area — the place where we do the miracle of making meaning out of those funny sounds we emit called words. Broca's Area Engagement. During interaction, meaningful words have to be produced, so Broca's area is involved. Broca's area is engaged whenever we do the brain miracle of translating our thoughts into words. Broca's area allows us to do the complex work of word choice, grammar, and syntax, and to achieve verbal fluency. Prefrontal Cortex Engagement. The Prefrontal Cortex — The "Thinking Brain" — is engaged in many ways as we exchange ideas. First we are evaluating the congruency or authenticity of the messages we receive. For example, if the person says she is excited, but her body language says she is bored, we do not believe her message. More importantly, we constantly compare the information and conceptual frameworks provided by others with our own. As we receive new information, we must ask: Does this information fit into my conceptual framework or does it challenge my framework. Can I assimilate the information or must I accommodate my framework? This constant process of assimilation and accommodation is how we make sense of the world and it is the work of the prefrontal cortex. One of the reasons social interaction so consistently leads to higher-level thinking is that during an exchange of ideas one person provides the other with new information and new conceptual frameworks. As we receive new ideas, we change the way we conceptualize the world; we are forced to a higher-level synthesis. There is much more brain engagement than is pictured in the four PET scan slides described. The slides don't show the top of the head where the motor and pre-motor cortices are located and they also do not show the limbic system, deep inside the brain. Both areas are critically involved when partners problem solve together. Motor and Pre-Motor Cortex Engagement. 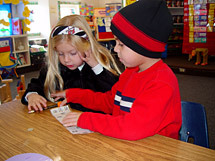 As students work together, especially if they are using manipulatives, their motor and pre-motor cortices are engaged. A great deal of the learning during peer interaction results from students modeling actions and skills. Further, communication experts claim that words make up only approximately 20% of our message. Non-verbal communication accounts for most of what we communicate. Without being aware of it, as we explain our thoughts to a partner or group we communicate our message with our body language, facial expressions, gestures. Thus our motor and pre-motor cortices are engaged in this way as well. Even if we are unaware of it, our message is never just verbal; it is bodily/kinesthetic as well! Mirror Neuron Engagement. One of the most exciting new areas of research on the brain involves the role of mirror neurons. The same neurons fire in our own brain when we watch someone performing an action as do when we actually perform that action. Thus as one student watches another solve a problem, neurons in the observer's brain "mirror" the neurons that are firing in the actors brain. Mirror neuron action goes a long way to explaining the power of modeling and observational learning. Mirror neurons also are engaged as we decode the communication of others. We don't just see the facial expressions, body language, and gestures of the person communicating our mirror neurons are engaged so we know what it is like to be the other person. For example, when we see the face of a person who is disgusted, the same neurons fire in our brains as when we are disgusted. Mirror neurons are the basis for empathy, which in turn is the root for all social connectedness. Limbic System Engagement. Emotion is processed deep inside the brain, in the limbic system. The limbic system is engaged during Kagan Structures because social interaction evokes emotion. Emotion is a signal to the brain to do two things: 1) Pay Attention! 2) Remember This! Why does emotion activate our attention and memory systems? Emotion is evoked when something is either good or bad, pleasant or unpleasant, painful or pleasurable. In brain lingo, emotion is a signal that something is either an opportunity or a threat. The brain is geared to pay attention to and remember opportunities and threats because that enhances our probability of survival. When there is emotion, the neurons in the brain actually fire at a higher frequency, signaling the reticular formation:"Pay Attention!" and signaling the hippocampus: "You better remember this!" Most of us remember where we were when we heard about the attack on the World Trade Center on September 11th. Why? Because the event was associated with strong emotion. James McGaugh, perhaps the world's leading expert on memory, discovered the principle of retrograde memory enhancement. The principle is spelled out in McGaugh's book, Memory and Emotion.5 Anything followed by emotion is more likely to be remembered. Kagan Structures elicit emotion which in turn enhances engagement and memory. This sequence [Interaction Emotion Alertness and Memory] goes a long way to explaining the learning gains that result when interactive Kagan Structures are used. Contrast students working in two different classrooms, but working on exactly the same worksheet. 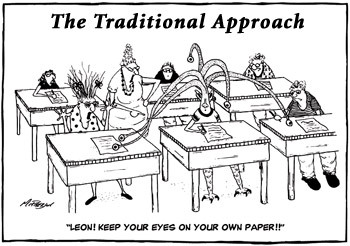 In the traditional classroom the teacher says, "Keep your eyes on your own paper!" In the traditional — "Work Alone" — classroom, it is easy for a mind to wander. After doing a few problems, many students experience mental drift. Their minds go to something they find more interesting. 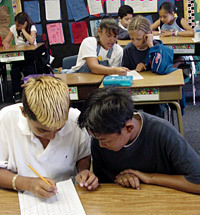 In contrast, during Sage-N-Scribe students keep each other on task. Students are accountable to their partner for a high degree of engagement, either as a Sage telling their partner what to write or as a Scribe listening to their partner tell them what to write and then responding. The traditional classroom is out of sync with today's generation of students who are accustomed to a high level of stimulation. Partner interaction boosts the level of stimulation, producing a level of engagement not possible when students work alone. At one level we don't need brain science to tell us the Kagan Structures increase engagement — we need only look at the facial expressions and body language of our students working alone v. working in structured interaction. Or, we can simply ask our students what is more engaging. When they work alone they often say class is boring; when they interact with their peers over the content, they tell us class is fun, interesting. A frequent comment from students using the structures: Time passed quickly. Why do they say that? When we are fully engaged we lose the sense of time, we enter the flow state. Although we don't need to be a brain scientist to see structures are engaging, it is comforting to know that brain science confirms and explains what we see: focused attention, heightened concentration, positive emotional involvement, and better retention and learning. In a word, we see enhanced engagement. The enhanced engagement and increased brain stimulation produced by Kagan Structures goes a long way to explaining why the structures consistently boost achievement. Through engagement we literally build better brains! Schwartz, J.M. & Begley, S. The Mind and the Brain: Neuroplasticity and the Power of Mental Force. New York: Harper Collins, 2002. Diamond, Marian & Hopson, Janet. Magic Trees of the Mind. How to nurture your child's intelligence, creativity, and healthy emotions from birth through adolescence. New York: Button, 1998. Carter, Rita. Mapping the Mind. Berkeley, CA: University of California Press, 1999. McGaugh, J. L. Memory and Emotion. The Making of Lasting Memories. New York: Columbia University Press, 2003.